Melasti Ceremony in Bali is a purification ceremony and ritual. Melasti also knew by the term "Melis" or "Mekiyis". In general, this ritual is held the three days prior to Nyepi Day (once a year). This unique tradition has a purpose to cleanse Bhuana Agung (world or universe) and Bhuana Alit (the people) from badness or bad spirit. This is done symbolically by using Tirta Amrita or "the water of life". Melasti Ceremony, Bali, 2017. Acrylic on Paper, 18 x 24 cm. On this day Balinese Hindus will be dressed in traditional costumes and bring all the God symbols to the sea or lake, which is believed to be the source of Tirta Amrita. All of sacred objects such as statue, nyasa, pratima or pralingga of the God (Ida Sang Hyang Widi Wasa) and also all of sacred equipments (pengawin) are being purified. The sacred equipments or pengawin (uparengga / ilen-ilen) is a set of tools that are used when a religious ritual is underway. It consists of: Umbul-umbul, Kober, Bandrangan, Tumbak, Mamas, Payung Pagut, Tedung Agung & Robrob, Penawesanga, and Dwaja. Due to the large number of equipments, so that in the procession towards the source of the water forms a convoy or a long parade. The parade is accompanied by the traditional Balinese instrument (Gamelan), vocal music (Kidung or Kekawin), and the priest leads among the people. Arriving at the ceremony location, all of sacred objects and sacred equipments are placed in such away, at a special place that has been prepared before. The process then continues with prayer presented to the Creator. After that the priest sprinkled holy water to the symbols of God and the people. The Balinese Melasti ceremony is mentioned in sacred literature, namely Lontar Sundarigama and Lontar Sang Hyang Aji Swamandala. In the Lontar Sundarigama mentioned the purposes of Melasti ceremony, which is "ngamet sarining amertha kamandalu ring telenging segara". This means taking the nectar of life called Tirta Amrita / Kamandalu (water source of life) in the middle of the ocean. While in the Lontar Sang Hyang Aji Swamandala mentioned, "Melasti ngarania ngiring prewatek Dewata, anganyutaken laraningjagat, papa kiesa, letuhing bhuwana". This means that the Melasti is a devotion to the Lord (Sang Hyang Widi) and invoke for strength to wash away the suffering of the people, eliminating papa klesa (papa klesa = soiling themselves and soiling the universe). After the procession of prayer is done, the people bring all of the symbols of God back to the temple and keep it sacred. 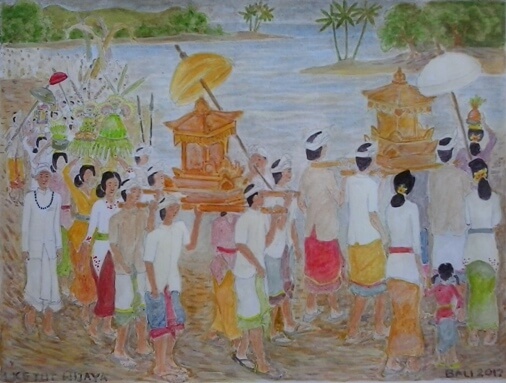 While carrying the sacred objects and sacred equipments, Balinese going towards the edge of the water and wash their bodies. It means as a symbol to release all of badness and let it drift away towards the ocean. The melasti ceremony Bali is full of the great cultural values.